What does it mean to be an engaged American in today’s divided political landscape, and how do we restore hope in our country? 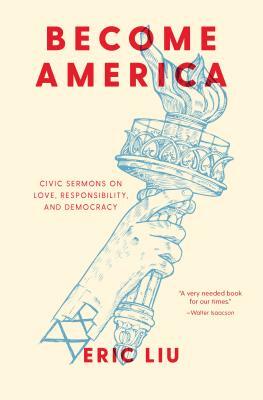 In a collection of “civic sermons” delivered at gatherings around the nation, popular advocate for active citizenship Eric Liu takes on these thorny questions and provides inspiration and solace in a time of anger, fear, and dismay over the state of the Union. Here are 19 stirring explorations of current and timeless topics about democracy, liberty, equal justice, and powerful citizenship. This book will energize you to get involved, in ways both large and small, to help rebuild a country that you’re proud to call home. Become America will challenge you to rehumanize our politics and rekindle a spirit of love in civic life. Eric Liu is the co-founder and CEO of Citizen University and executive director of the Aspen Institute Citizenship and American Identity Program. His books include You're More Powerful Than You Think: A Citizen's Guide to Making Change Happen and The Gardens of Democracy. Eric served as a White House speechwriter and policy advisor for President Bill Clinton. He is a correspondent for TheAtlantic.com and his TED Talks on citizen power and voting have been viewed nearly 3 million times. Follow him at @ericpliu.